An international team of Spanish and Portuguese researchers (Universidad de Zaragoza, Euskal Herriko Unibertsitatea and Universidade Nova de Lisboa) that has discovered and described a new species of sirenian, a primitive marine mammal that swam in the waters of the Sobrarbe-Pirineos UNESCO Global Geopark (Huesca, Northeastern Spain). 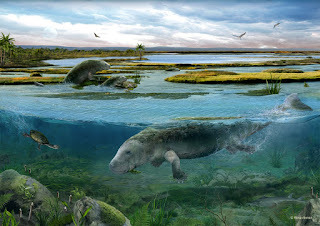 This new mammal is the first four-legged sirenian from Eurasia, and the oldest of its kind in West Europe, with an age of 42 million years. Sirenians are the only plant-eating marine mammals, which has earned them their nickname as “sea cows”. Nowadays, they are represented by the dugongs and manatees. 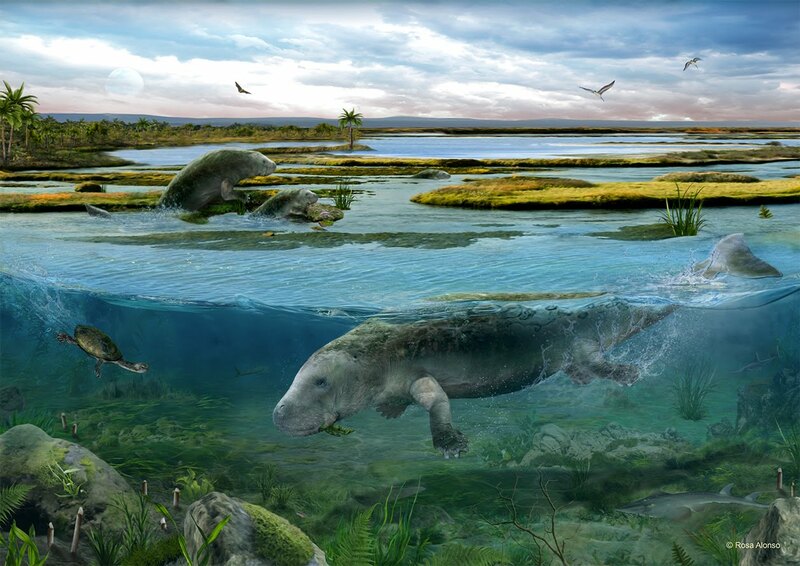 The new “sea cow” was found in the Spanish Pyrenees and has been described in the journal Scientific Reports. The name, Sobrarbesiren cardieli, honours both the territory of Sobrarbe and the local amateur palaeontologist Jesús Cardiel Lalueza, who found the fossil quarry. It represents a key step in the evolution of sirenians, this being a four-legged animal yet to be fully adapted to the aquatic environment. 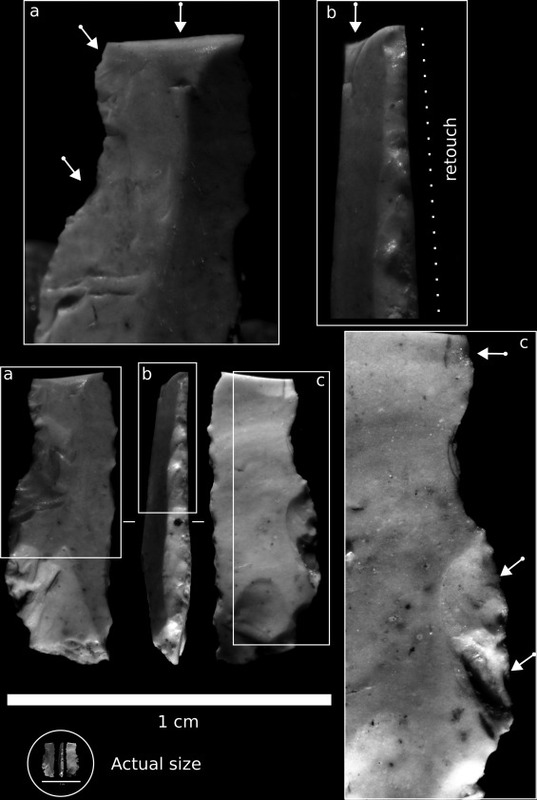 This research is part of the PhD thesis of Ester Díaz Berenguer, who is currently studying the anatomy of Sobrarbesiren cardieli in detail to unveil how this animal lived, particularly whether it was able to walk on land or used its legs for swimming. The field expeditions in Sobrarbe started in 2009, under the management of Prof. Ainara Badiola, and 600 fossils have now been collected. These are 42 million years old (middle Eocene in age). Of these, over 300 are sirenian bones, belonging to at least seven individuals, including adults and juveniles. Most of the skeleton of Sobrarbesiren cardieli is known, including three skulls, several vertebrae and ribs, and bones from all four legs. Of extraordinary importance are the pelvis, femur and fibula – the latter being the oldest recorded in any sirenian worldwide – which allow the study of Sobrarbesiren’s lifestyle. The fossil quarry has also yielded remains of turtles, crocodiles, lizards, sharks and small mammals, together with invertebrate animals and plants. This fauna and flora has permitted the reconstruction of the palaeoenvironment where Sobrarbesiren cardieli lived and died, a coastal delta with a tropical climate, flowing into the Cantabrian Sea. All fossils were excavated with the authorization of the regional government (Dirección General de Cultura y Patrimonio) and are housed in the Museo de Ciencias Naturales de la Universidad de Zaragoza. A selection of the most relevant specimens will soon be in an exhibition in the gallery of the museum, located in the University Paraninfo building. 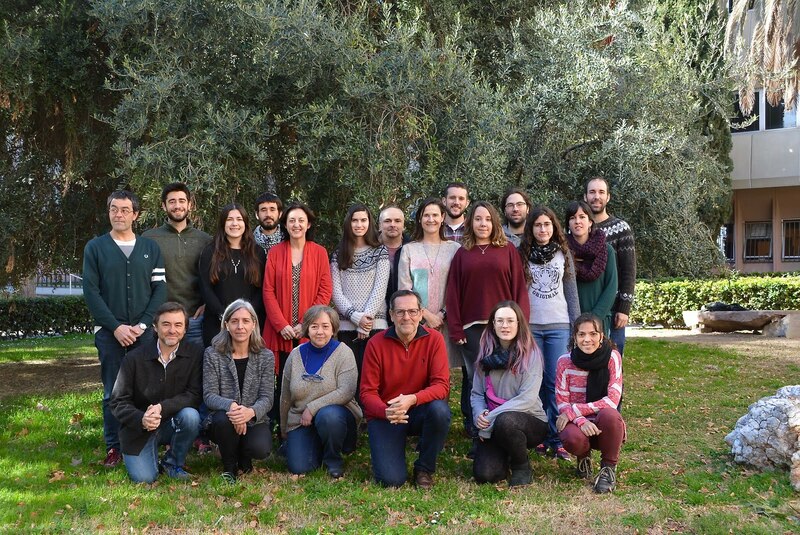 Ongoing research is being funded and supported by several institutions (Universidades de Zaragoza y del País Vasco, Geoparque de Sobrarbe, Gobiernos de Aragón y del País Vasco, Mineco, Fondo Europeo de Desarrollo Regional). What a sirenian looks like? Four sirenian species, including three manatees and the dugong, have survived until nowadays. They first evolved 50 million years ago, from the same group of terrestrial mammals that gave rise to the elephants, in the African continent. Their aquatic lifestyle resulted in a series of changes in their body, including hair and ear loss, a hydrodynamic body shape, hands modified into flippers and the progressive reduction of the legs, which are completely lost in modern forms. They also modified the lungs, which occupy most of the body of the animal. Their flattened tail, used for propelling the animal, together with thick and dense bones, makes them slow swimmers, feeding in the shallow sea grasses. Publicado por Aragosaurus el 4/11/2018 12:03:00 p. m.